T he packages of beef jerky at the gas station make every fiber of my body shudder. I can’t get past the thought of consuming any part of that slimy, salty, chewy “beef product”… the expiration date and unpronounceable ingredient list reveal a recipe for a disgusting, bloated disaster. But too often it’s the only quick protein to be found in a convenience store when on the road, so I reach for roasted nuts, which are a poor substitute when craving meat. I don’t have to worry about that anymore. I’m always looking out for proteins I can tote in my bag for a hike, an airplane or a car ride. When I saw a recipe for homemade beef jerky in a pretty decent cookbook I’m reading — The Complete Idiot’s Guide to Low-Carb Meals — I was intrigued. 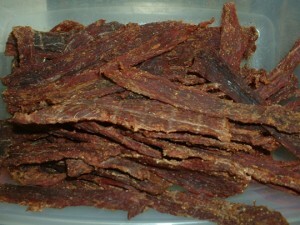 I assumed beef jerky was made from “parts” and not real anything, but this recipe was relatively easy, healthy and tasty. But it takes a whole day to bake plus marinating time — definitely a weekend project. I altered the original recipes to suit my taste. 1. 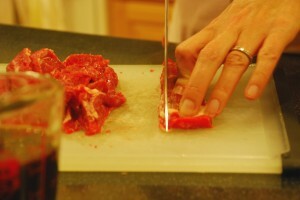 Place meat in the freezer for one hour to make it easier to slice thinly. Remove from the freezer and, using a very sharp knife, slice into 1/16 – 1/8 thick slices. This part is the biggest pain but you can power through it. Place meat in a zip lock bag with vinegar and remaining ingredients. Marinate at least 8 hours or overnight. 2. Preheat oven to 170 degrees. Drain meat then place directly on the oven racks in single layers. I cleaned my racks before doing this and then cleaned them afterwards. You could also put them on cookie racks on top of the oven racks — the main thing to keep in mind is that the meat needs airflow around it to dry. Place foil on the bottom of your oven to catch any drippings. 3. Leave the oven cracked while you’re cooking and bake about 7 hours or until the meat is chewy and dried-looking. 4. Store in an airtight container in the refrigerator up to six months. Travels well in air-temperature too. Hi Edward – Thanks for the question. This recipe would absolutely work with an electric dryer. Should be much quicker too. Enjoy!